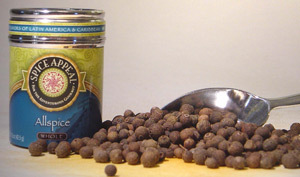 This warm and wonderful blend of cloves, cinnamon, nutmeg and black pepper reflects the unique fusion of cultures of its Caribbean origin. Its aromatic qualities and pungent taste are a welcome addition to curries, stews, barbecues and sweet potatoes. As the main ingredient to Jamaica’s popular jerk seasoning, it gives a smoky and spicy flavor when rubbed over pork, chicken or fish that are cooked over a fire.